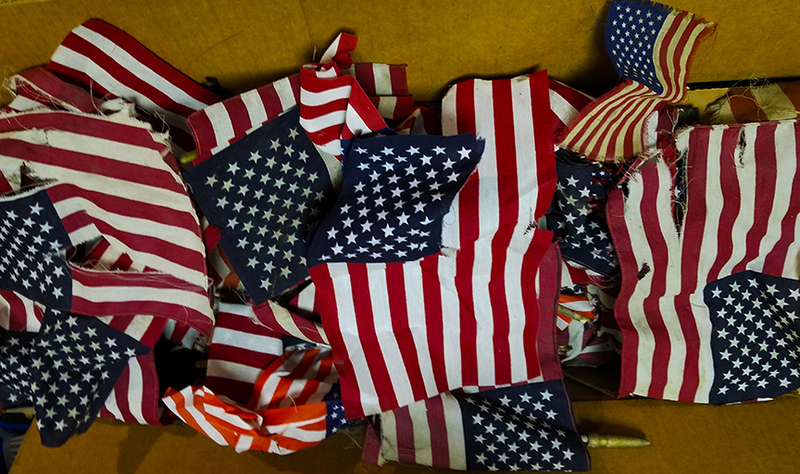 In the studio I have a big box that is overflowing with small flags that we have picked up at the local cemetery where we often walk. There are probably 300 to 400 of them jammed in this box. Most are faded, dirty and ripped. Some have just come detached from their dowel from the wind and the rain. And some are shredded by the mowing crews who won’t take a moment to get off their machines to pick them up before running over them. I am sure these same guys are probably having a fit that some NFL players are silently protesting by taking a knee during the playing of the national anthem. I have been thinking over the years about incorporating them into a project but it hasn’t taken shape yet. But we continue to pick them up, often replacing them with new flags. I can’t fully explain why. I don’t blindly worship the flag, don’t consider myself any more patriotic than the next person. I certainly don’t believe that we are in any way perfect as a nation. Far from it. We are by definition a work in progress– so long as there is progress to made we are not done evolving as a nation. There’s just something about seeing it being treated so badly that irks me a bit. But I don’t feel that same way at all when I see NFL players silently protesting in a dignified and respectful manner. In fact, their protests to me align perfectly with the symbol of the flag as I see it. People have somehow come to believe, in the politicization of it, that it solely represents the troops and first responders. Well, while it does represent them it also flies as symbol for every citizen and their equal status in this nation. Every single citizen is represented in those stars and bars. City folk, country folk, black, white, hispanic, Asian, etc– it doesn’t matter so far as that symbol is concerned. It represents us all under the defining concept of this country that we all are granted the same rights and opportunities and bear the same responsibilities. It is not just a flag that reminds us of our past. It is our symbol of an aspiration to be ever better, to move far beyond the flaws of the past. That flag is a symbol that wants us to stand against injustices, to protest wrongs, to help the oppressed and to move us closer to what we hope is a perfect state of being. It is in many ways a flag of protest. Almost all of the progress that has been made in this country– abolishment of slavery, workers rights, universal suffrage, civil rights and so many other things we take for granted on a day to day basis– came about as a result of citizens standing in protest to what they saw as a wrong. In fact, protest had a hand in saving the lives of troops by forcing the government to end the conflict in Viet Nam. So, if the players’ protests bother you, ask yourself why you are so offended. Ask yourself what you have done to make this country a better place. Have you helped another American in in distress lately? There are 3 and a half million American citizens living in Puerto Rico who are fighting for their survival and you are worried that these players in their silent protest are somehow ruining America? If you love the flag and the country so much, make it better. Recognize those things that wrong us all or help somebody. There are more US citizens in Puerto Rico than the the combined populations of Wyoming, Montana and North and South Dakota. Imagine if every citizen in those four states was on the edge of losing everything they held dear, including their lives. Wouldn’t you want to reach out to them? Wouldn’t you want to give them the same kind of help you would want if such a thing ever came your way? If you do think there is a difference helping those states than in extending all the assistance we can muster to Puerto Rico, you are most likely bothered by the NFL protests. In which case, maybe you should look at yourself in the mirror and acknowledge what kind of person you really are. You might wave the flag, you might even worship the goddamn thing, but you are no patriot. I have said my piece so let’s move on to this week’s Sunday morning music, one that is made to order for this blog entry. It’s John Prine’s classic protest song about flag wavers and their empty patriotism, Your Flag Decal Won’t Get You Into Heaven Anymore. It feels as relevant today as it did in 1972.